Khanty–Mansi Autonomous Okrug (Roushie: Ха́нты-Манси́йский автоно́мный о́круг — Югра́, Khanty-Mansiysky avtonomny okrug – Yugra), an aw kent as Yugra, is a federal subject o Roushie (an autonomous okrug o Tyumen Oblast). Population: 1,532,243 (2010 Census). The people native tae the region are the Khanty an the Mansi, kent collectively as Ob Ugric fowk. The local leids, Khanty leid an Mansi leid, which are relatit tae Hungarian, enjoy special status in the autonomous okrug, while Roushie remains the anerlie offeecial leid. The majority o the ile producit in Roushie comes frae Khanty–Mansi Autonomous Okrug, givin the region great economic importance. Principal rivers are the Ob an its tributary the Irtysh. Khanty–Mansi Autonomous Okrug is traversed bi the northeasterly line o equal latitude an langitude. Population: 1,532,243 (2010 Census); 1,432,817 (2002 Census); 1,268,439 (1989 Census). 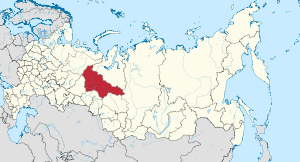 Khanty–Mansi Autonomous Okrug haes an aurie o 523,100 km², but the aurie is spairsely populatit. The admeenistrative centre is Khanty-Mansiysk, but the lairgest ceeties are Surgut, Nizhnevartovsk, an Nefteyugansk. 1 102,138 fowk wur registered frae admeenistrative databases, an coud no declare an ethnicity. It is estimatit that the proportion o ethnicities in this group is the same as that o the declared group. A majority o the population is Orthodox Christian, while a significant minority (aboot 17%) o the population follaes Islam. In the Khanty–Mansi Autonomous Okrug – Yugra, primary transport o guids accoontit for watter an railwey transport, 29% is transportit bi road, an 2% aviation. The tot lenth o railwey tracks 1106 km. The lenth o roads, mair nor 18000. ↑ 5.0 5.1 5.2 Roushie Federal State Stateestics Service (2011). "Всероссийская перепись населения 2010 года. Том 1" [2010 Aw-Roushie Population Census, vol. 1]. Всероссийская перепись населения 2010 года (2010 Aw-Roushie Population Census) (in Roushie). Federal State Stateestics Service. Retrieved June 29, 2012. ↑ "National Composition of Population for Regions of the Russian Federation" (XLS). 2010 Russian All-Population Census. 2010. Retrieved 2011-12-22. Wikimedia Commons haes media relatit tae Khanty–Mansi Autonomous Okrug.